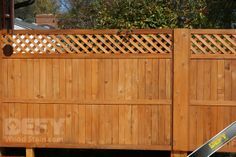 One of the best wood fence stains on the market is Defy Extreme. The specially designed formula of Defy Extreme is a perfect choice for all types of wood fencing. The unique blend of synthetic resins and Nano particles help reflect harmful UV rays to stop graying like no other stain before it. The same technology that blocks out the sun like never before also does extremely well to lock out unwanted moisture that can lead to rot and decay. The moisture blocking abilities of Defy Extreme also means less risk of mold and mildew, which can be a nightmare to deal with. Defy Extreme is offered in many tinted transparent tones to appeal to anyone’s taste. From natural colors to reds, browns, and Driftwood Gray there is a tone to match your needs. An extremely tough wood stain like Defy Extreme is perfect for fences. Your wooden fence gets all kinds of abuse from the elements, watering, sprinkler systems, due from the grass every morning, harsh sunrays and so on. Defy Extreme provides a barrier of protection against all types of damage. Apply Defy Extreme to both newer and older wood fences of all types. With the Green Performance Standards of The Master Painter’s Institute meet by Defy Extreme you can be glad knowing you are using the most Eco-Friendly high performance wood stain on the market. Get lasting beauty and protection with Defy Extreme.